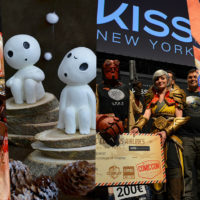 Every year, the Power House Gaming school schedules a big E-sport event at the “Palais des Sports” of Mulhouse (a “traditional” sports venues in the city), the Power Gaming Series. 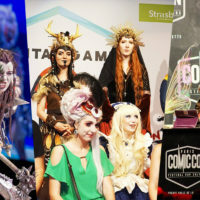 It serves as an end-of-year exam for the students of the school, who must set up a spectacular competition putting face to face the best local teams to grab a cashprize of more than 7500 €. The school wanted to make its event shine with a trophy worthy of its ambitions. We had already made the 2017’s edition (much more modest by the way), and it was only natural to us to offer our services to PHG for this year’s trophies as well. The result of this cooperation is pretty much the most beautiful piece we have made to date. 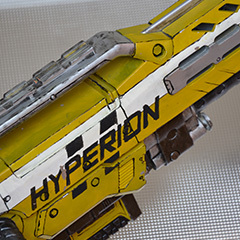 In this article we will show you the process of creating this resin juggernaut, from the initial sketches to the studio photos, with all of the (sometimes difficult) manufacturing stages. To begin the project, Marie drew some sketches to know in which direction we were going. 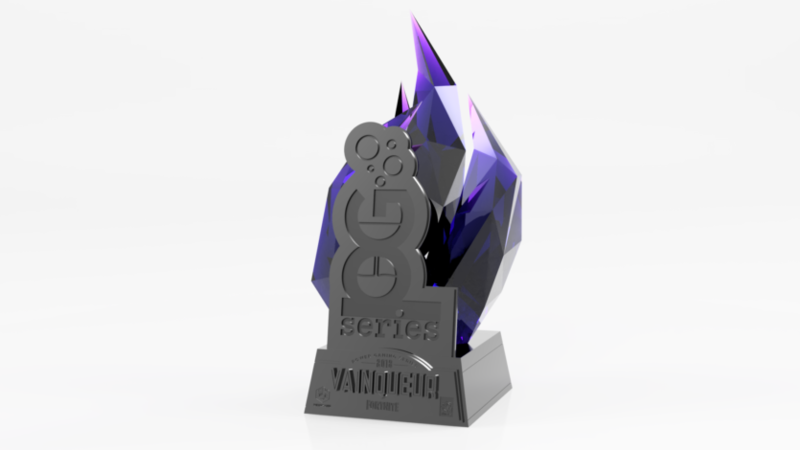 We opted for transparent crystals quite early, because the rendering of this type of trophy is excellent, as evidenced by many achievements of the master in the field: Volpin Props. Here we went for the “spinning flames” version because of its imposing look and impressive physics (it’s not very common to see crystal flames that are spinning!). The base is massive to stay consistent with the proportions of the flame, but it remains very sober with its truncated pyramid shape (or “keyboard key” shape as we like to call it) and the two grooves that run all around it. This keeps the viewer’s attention on the gem. 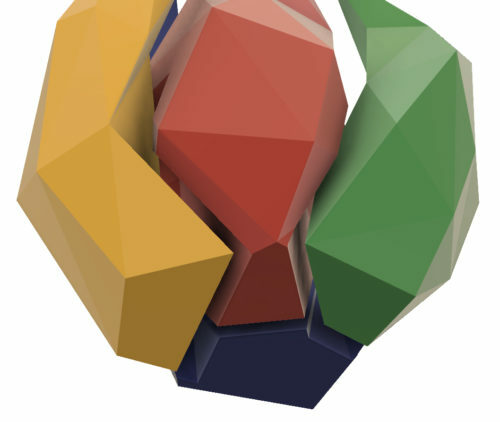 The various colors, from left to right: PowerHouseGaming (for the school), League of Legends, Counter-Strike and Fortnite. 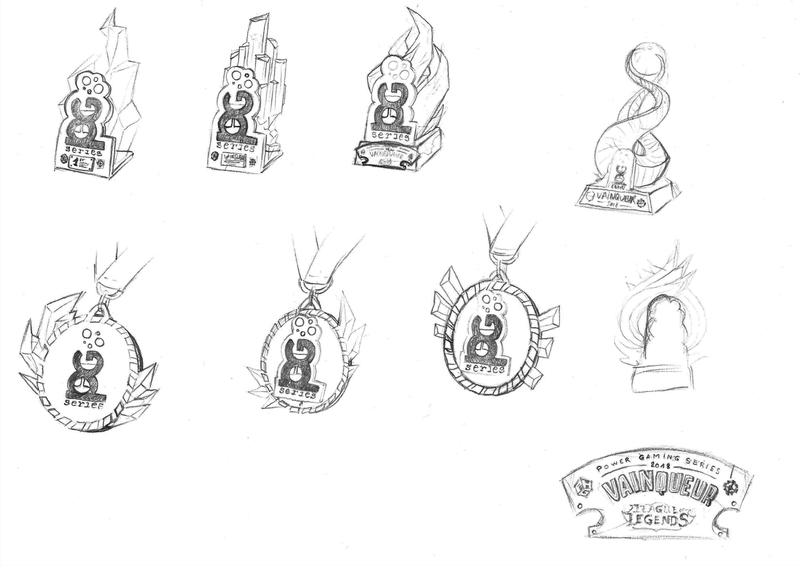 Finally, each trophy has a plate and a specific color depending on the game that it represents, which increases the work required a little bit, but greatly increases the prestige of each of the trophies! After having validated the design with our client, we were able to begin the next stage of the process: turning 2D into 3D! Joris took charge of this stage. He is more fluent at parametric modeling (with dimensions and functions) than organic modeling (with dots and meshes), but modeling whirling crystal flames has proven far too complicated using only parametric modeling. So he had to adapt. 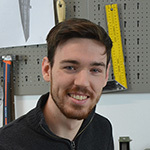 He chose the software “Fusion 360”, which, thanks to its parametric AND organic modeling capabilities, was the ideal tool for this project. And the icing on the cake? These two types of modeling can blend together to create clean and precise assemblies. 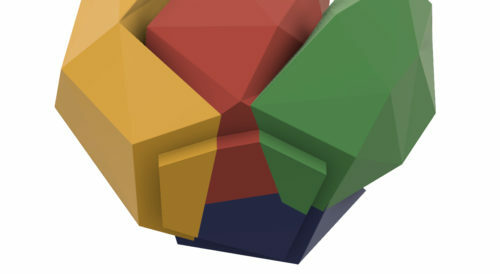 The four flames were modeled one by one, by hand, simply starting with a five-sided prism. They were then put in place to have a first glimpse of the overall shape. Once finished and placed, the flames intersected one another in the drawing. To create the assembly, we just had to “subtract” each flame to the next to obtain notches, which would make them match perfectly when putting the big flame together afterwards. Demonstration of how the flames snap into place. The notch of the flame. Onto the logo and game plates now : they were drawn on Illustrator by Marie in advance, and gained a dimension after a ““simple”” import into Fusion360. Working on a render was not essential to the project, but it’s always better to take a few hours so you can get a clear picture of the result of your modeling. This also allowed our client to have a view on the progress of the project and the final aspect we were going for. Also, it looks very cool! It’s now time to get down to business: making the prototype, or “master”. 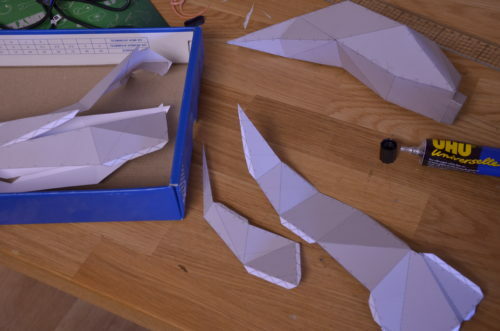 The first idea was to export the 3D models of the flames to Pepakura in order to make the complete shape in papercraft. 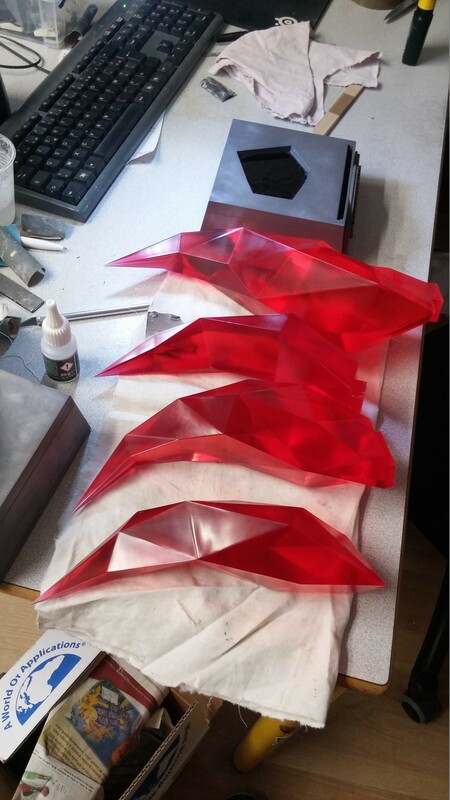 Once assembled, the four flames would be filled with resin, separated, cleaned and then molded. 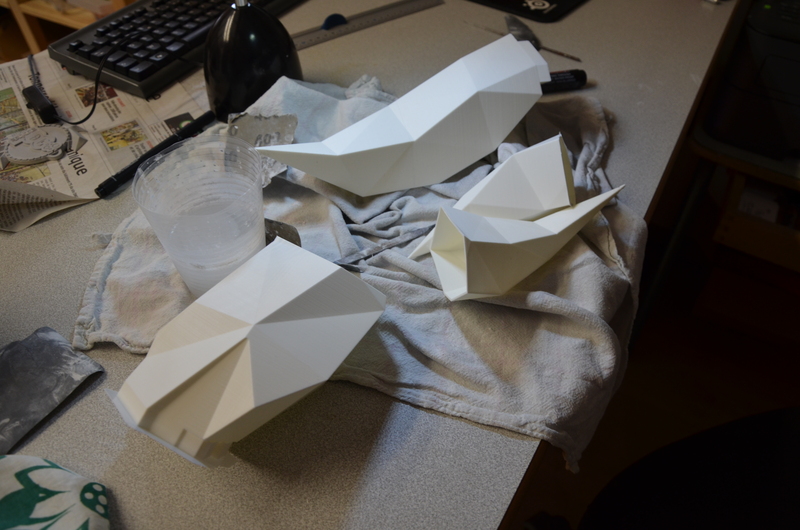 Glue and paper are essential tools to craft Pepakura. But the paper was too fragile to hold resin on the inside and the poor tightness of the assembly left something to be desired. A first preview of an potentially theoratical eventual render. 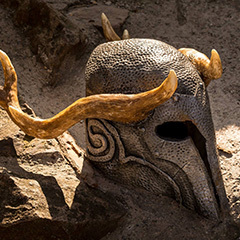 In addition, the notches are very precise so that the flames fit together well, and on top of that, the flame assembly is then inserted into the notch located in the base of the trophy, so the slightest deformation will prevent full assembly of the final trophy. 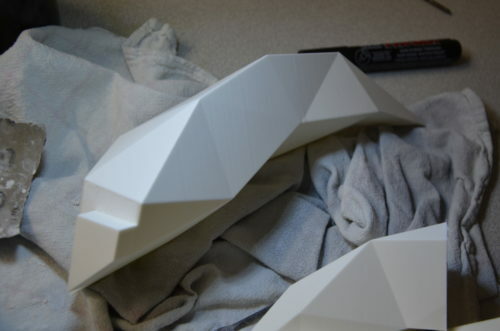 With this method, we save a lot of time on the construction of the shape but lose a lot on the smoothing of it. The accuracy is practically perfect, and the good fit of the parts is pretty much guaranteed. 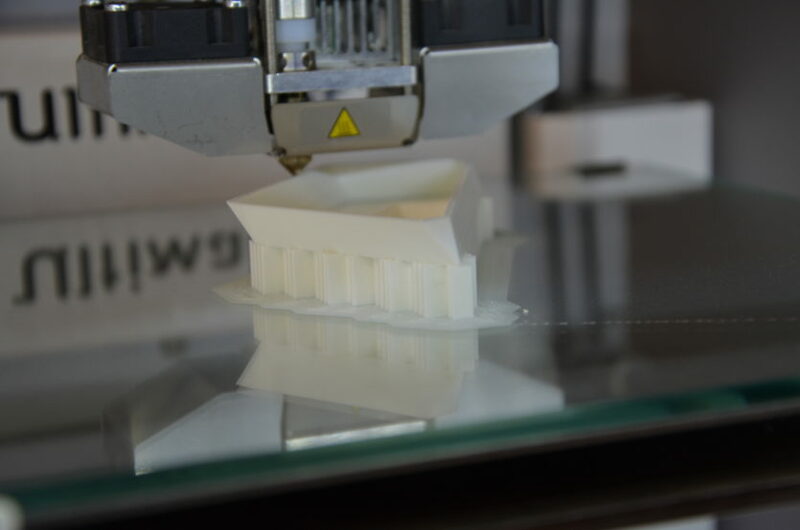 Our trusty Ultimaker 2+ doing its job. 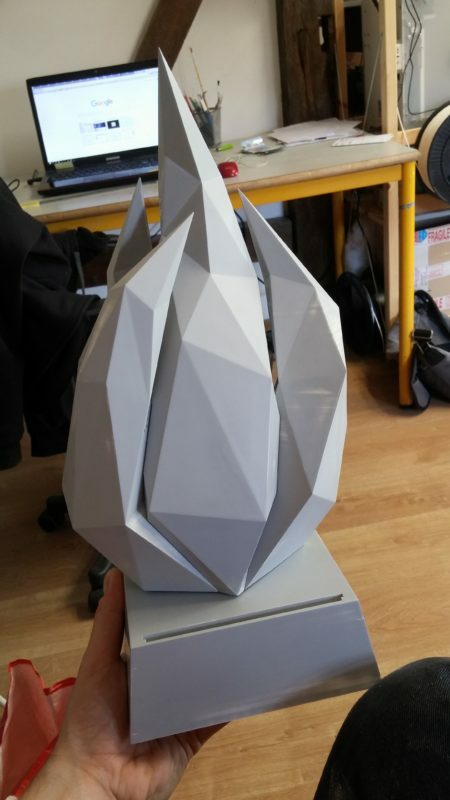 So we printed each flame in two parts (they range from 25 to 33 cm in height), with a thick wall, no fill, and being mindful to leave the top or bottom open, depending on the part. Our flames fresh out of the printer. 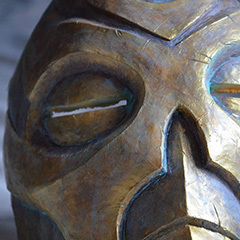 Once printed, the flame parts were glued together with super glue, while carefully aligning the faces. The slightest offset could jeopardize the overall assembly. Our parts are now ready to undergo to the longest stage. 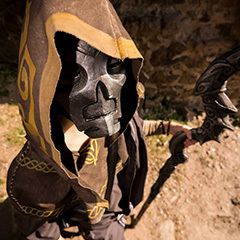 To smooth out a printed piece of PLA, there are not a great deal of options, you have to sand, sand, and sand again. 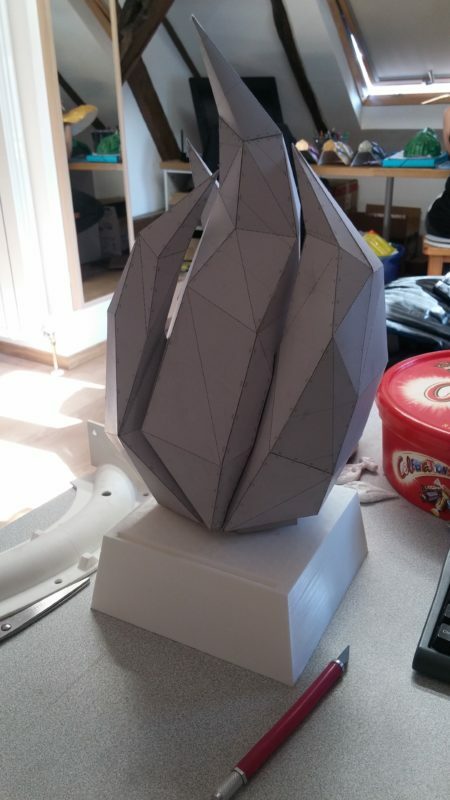 The central flame sprayed with putty, soon ready to sand. 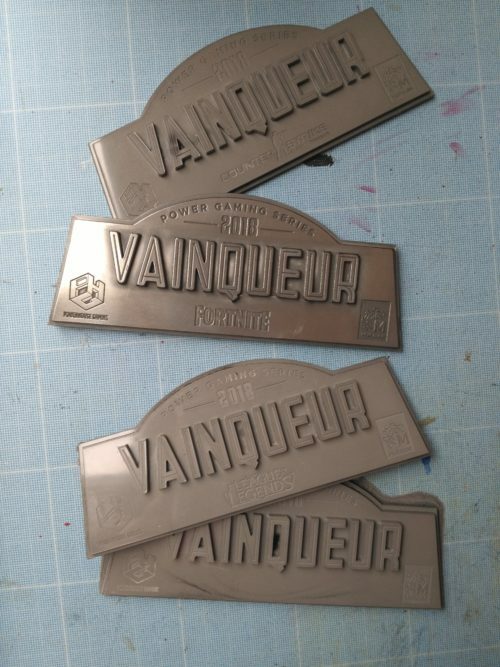 The prototypes of the plates for the trophy base are made using a great machine: the laser cutter. 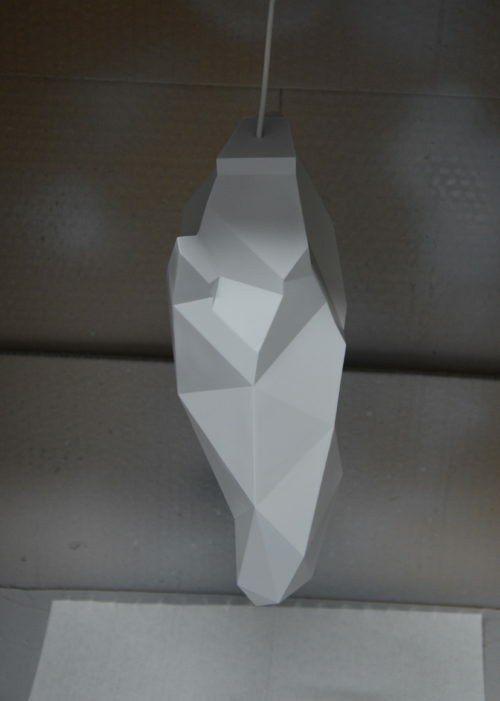 The same vector drawings used to model the trophy in 3D are used here to cut acrylic plates (transparent plastic). They are then glued on top of each other. The “game” plate for example is made out of three levels: The first plate at the back, the second, a little smaller, is glued on top to obtain a kind of base where the letters are glued on. 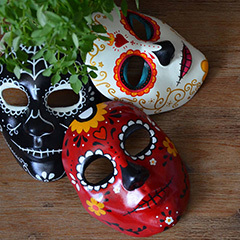 The spots where the elements need to be glued are engraved very lightly on the material for a perfect result, and no unsightly trace ruins the final result. 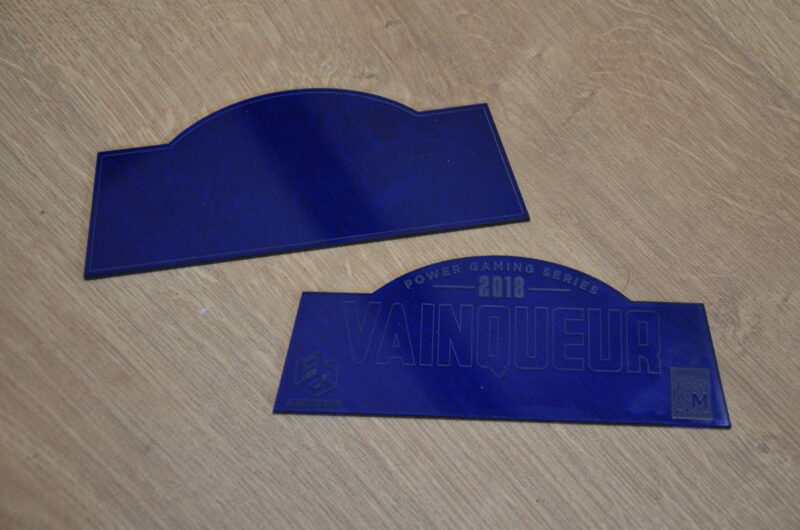 Two pieces of acrylic for the game plates. We can see the outlines where the letters will later be glued. 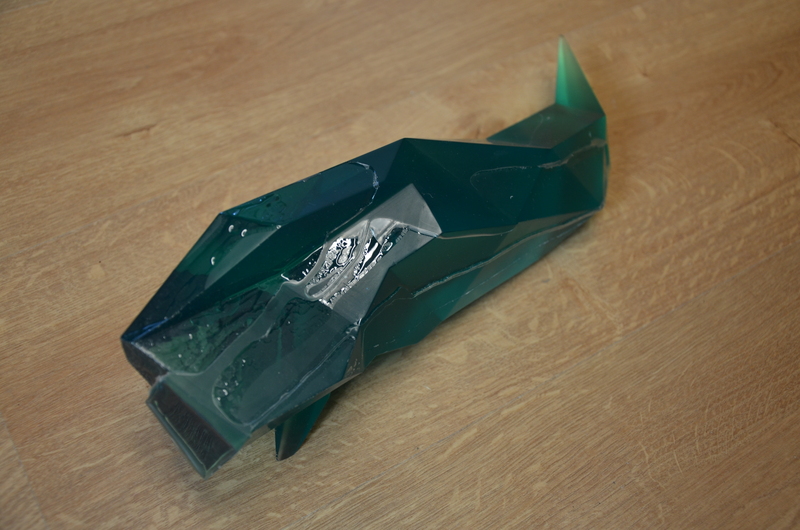 To ensure that the final trophy assembly will go well, we have to test with the prototype first. A moment of great stress, because if it goes wrong, that means a lot of time lost to find the cause, and how to solve the problem. Fortunately for us, everything did fit well, and a simple sanding has transformed some narrow margins into well-adjusted margins. 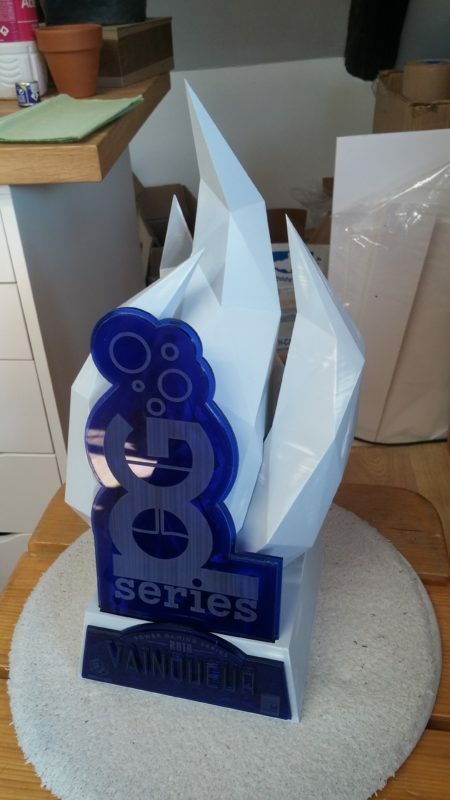 The prototype of the trophy fully assembled. Our master is now finished. We can move on to the next big chunk. 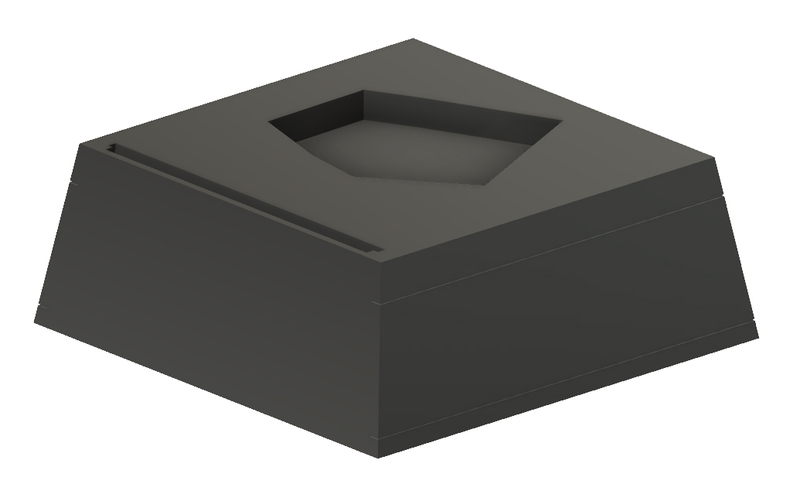 This step will take a footprint of our prototype and enable us to reproduce it in several copies “easily”. For this, we will mold the different parts apart, and use these molds to make copies of these parts. For the base, a good old block mold did the trick. 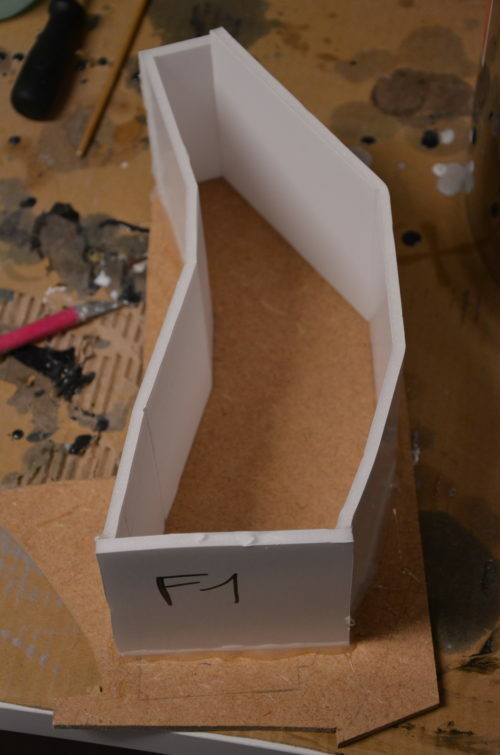 Given the size of the object, we gave the mold good wall thickness to keep a good shape during the cast. The mold for the base of the trophy. We thought that a mold as basic as this would be easy to use, but we will see in the next part that we were far from the truth! 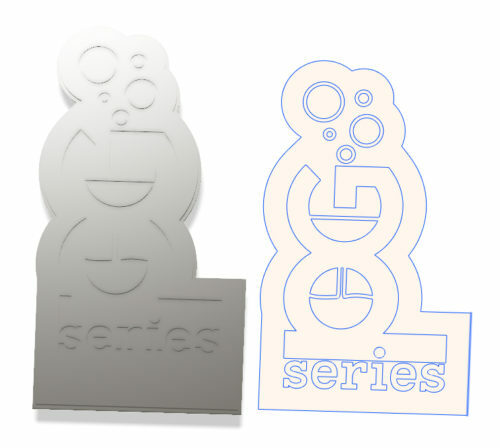 The plates of each game and of the PGS logo were molded at the same time (5 in total). Simply glued on a wooden board, we poured the silicone over them, and once polymerized, unmolded the large plate and cut each mold apart. 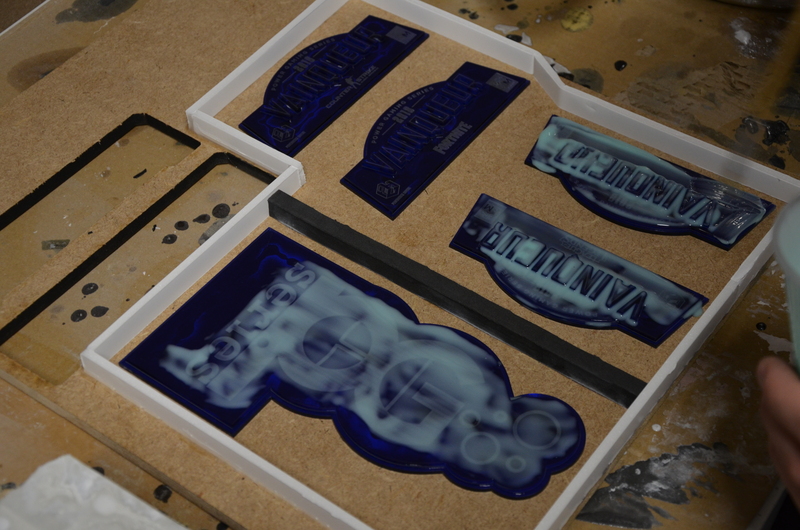 The plates are first brushed on with silicone to prevent bubbles. Now the flames, they each required a bit of preparation. It was first necessary to determine the correct profile of each flame in order to use as little silicone as possible. Indeed, placing the flame in a non-optimal direction could have made us use up to twice as much material, and silicone is rather expensive! So a little optimization work was not superfluous. 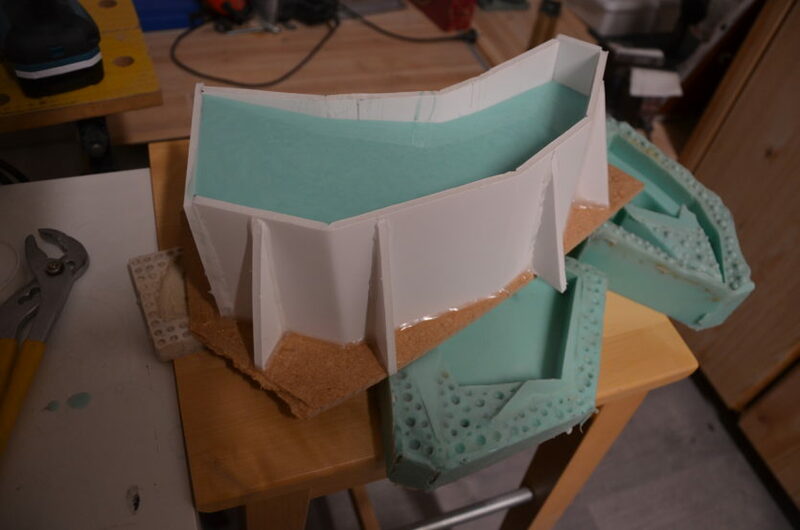 This allowed us to print a sheet that would show us where to build the walls around for the mold so they have just the right thickness to get an adequately stiff mold. The foam walls are glued so they follow the shape of the flame. When the keys are made, the clay is in place and we have made sure that the mold is perfectly clean, we pour the silicone in. 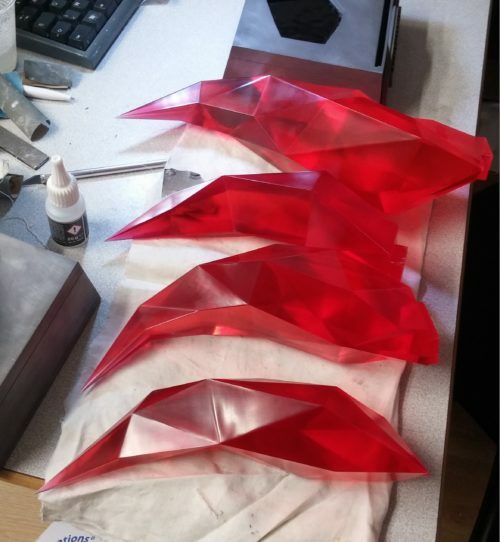 Once again for the sake of not wasting material, we tilted the mold so that the silicone does not accumulate in a corner unnecessarily but is distributed well on all the height of the crystal. The mold is tilted thanks to perfectly calibrated wedges. Twenty-four hours later, the first side is polymerized. 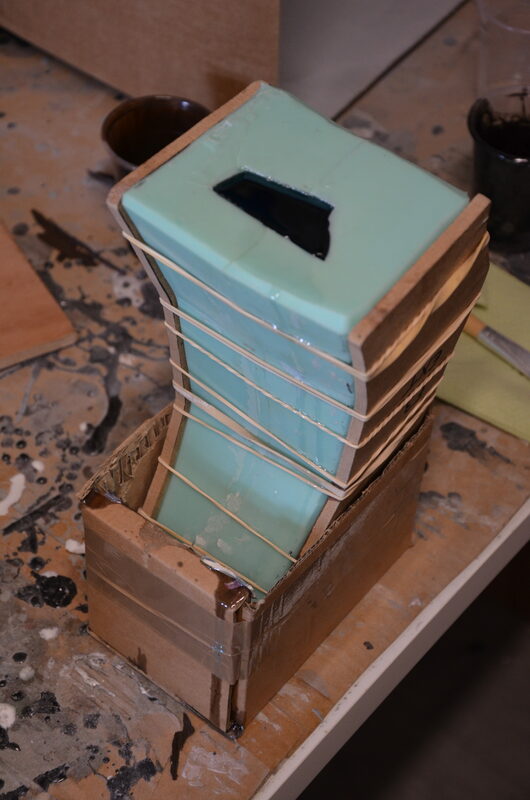 We turn our construction, remove the base and the clay, we clean everything well, pass a shot of Vaseline everywhere and pour the second part of silicone, again tilting the mold to distribute the material. 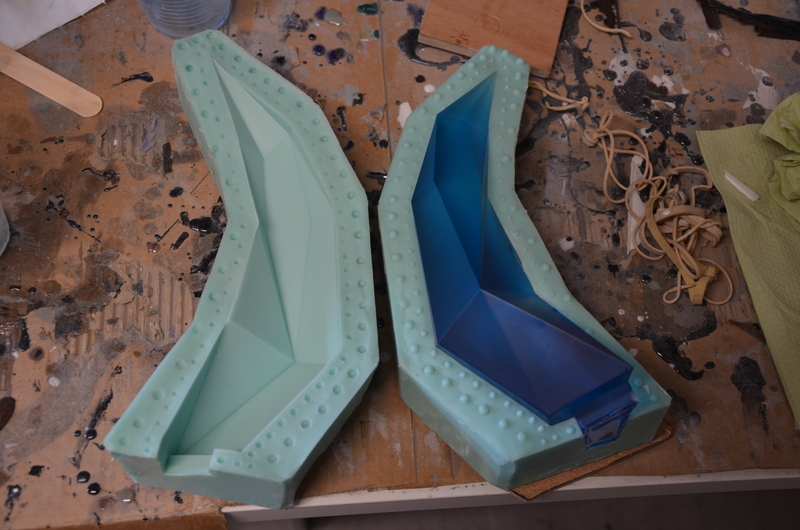 Once finished, we just have to disassemble and remove the master of our mold to keep only the silicone part! 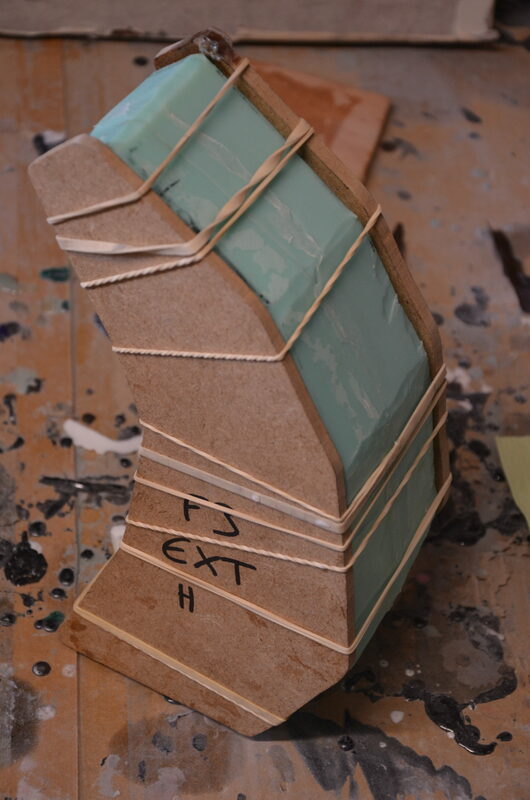 To hold the mold still during the casting, we cut wooden boards in the shape of the molds. They will surround our mold and keep it closed by elastics all the way up. A closed mold, ready to serve. 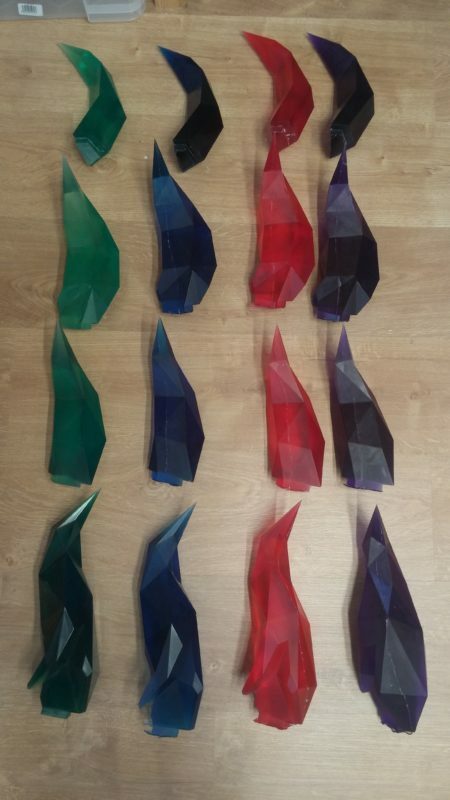 So we need to make four flames of different sizes but of identical color for each trophy. 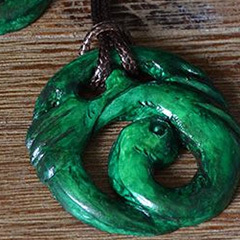 For this we use products from Smooth-On, namely the transparent resin Smooth-Cast 326 EU and the So-Strong pigments for tinting the resin. Here’s what happens when you wanna work too fast. First, we need to pour the B part of the resin gently into the cup to avoid bubbles, and add the right dose of dye to get a color that is neither too light nor too dark. Then mix for a good while to avoid dye fillets that can stay in the cup and break the consistency of the final color. This precaution is also required later, when mixing with Part A, which requires both speed and delicacy, because once poured, catalysis begins immediately and no bubbles must appear! With our cups full of resin, we must now lean the mold and pour the resin gently into it so that the liquid flows along the wall and produces no bubbles. We then lean the mold in the other direction to prevent a large bubble from being trapped in the base of the flame. We complete the filling with the mold held straight. And never mind if it overflows. 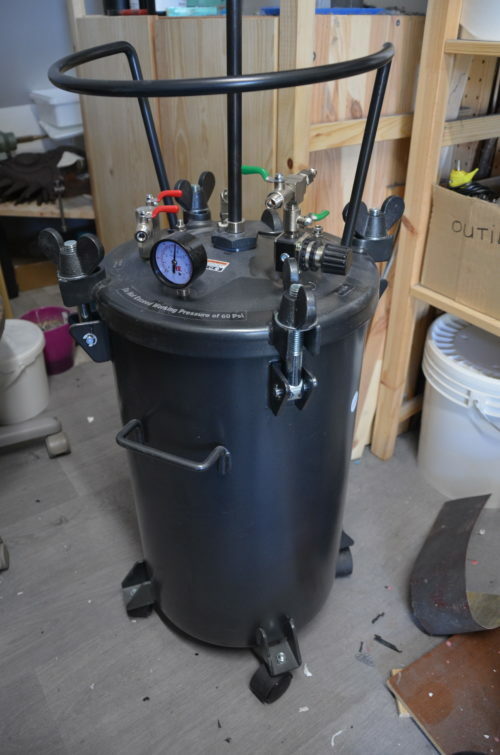 Once filled and placed in a small cardboard stabilizer, everything is gently deposited at the bottom of a pressure pot (here 40L). 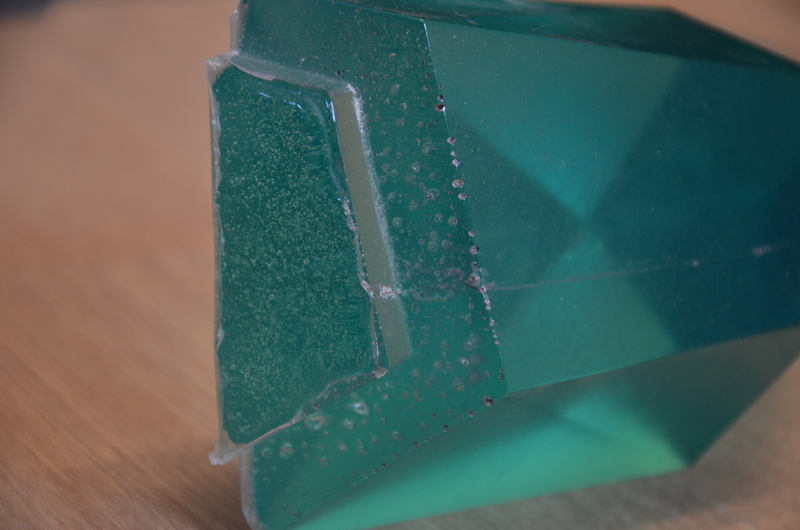 Once closed and put under 4 bar of pressure, the bubbles that were inevitably contained in our resin were crushed under the effect of pressure to become almost invisible to the naked eye. The flame is ready to be pressurized. Our 40L pressure pot under 4Bar of pressure. After one hour of catalysis, the resin is solid and ready to leave the mold. 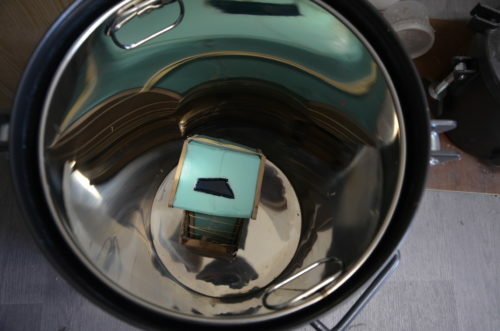 We must also be careful during this process because it can reach impressive temperatures, and you can burn your fingers! A nice flame freshly unmolded. We repeat this process three times, to get our four flames of the same color, and we now take care of the base of the trophy. 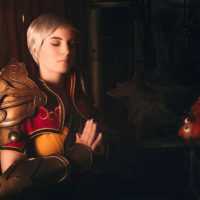 So we ended up with 4 perfectly useless and expensive resin blocks, and each new attempt was accompanied by various prayers to the deities of our choice. Fortunately we finally got the hang of it and cast four usable bases. At least the will do fine door stops. 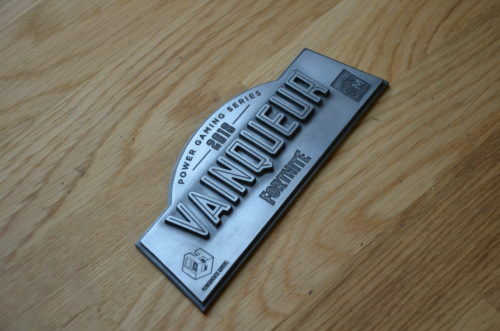 We wrap up the castings with the game and logo plates, really easy to achieve this time. The only trick was to use a different resin to put them under air pressure to avoid the retention of bubbles. By cleaning, we mean here the removal of surplus resin that inevitably occurs during the casting. This can be burrs, reinforcements, tapholes, joint planes, etc. 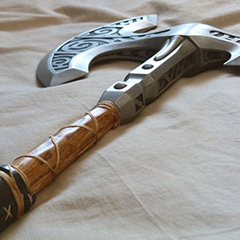 They are removed using a sanding table for the coarsest places, and a precision cutter, file and a set of abrasive paper for the finer details. This step is the fastest to describe but the longest to achieve. Each small imperfection in the resin must be erased as best as possible so that the result is perfect. And it can take a lot of time if these are deep. Once cleaned (ie at least three months later!) We are ready to polish. Mael takes care of this part, using our drill press equipped with different brushes and different polishing pastes. 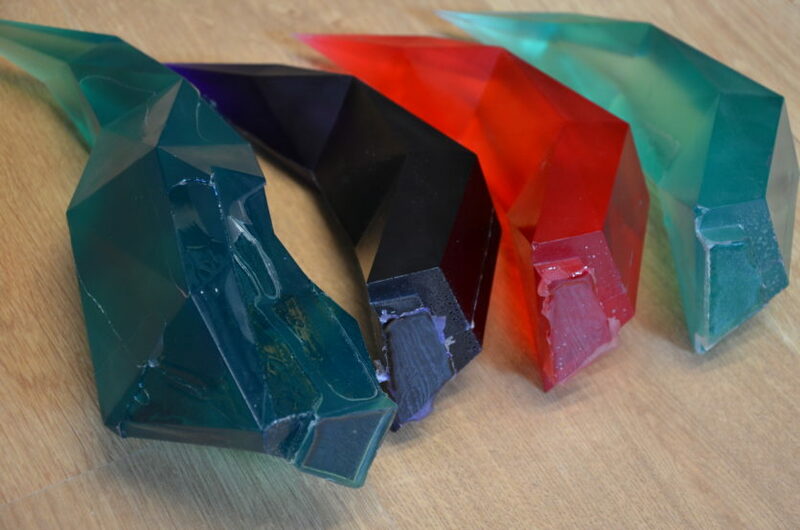 The successive passage of these products makes the crystals a little smoother and shinier after each step, until we finally get a surface so smooth that it gives the impression of holding a real gem in our hands. The polished flames. They shine a lot more than when they out of the molds! 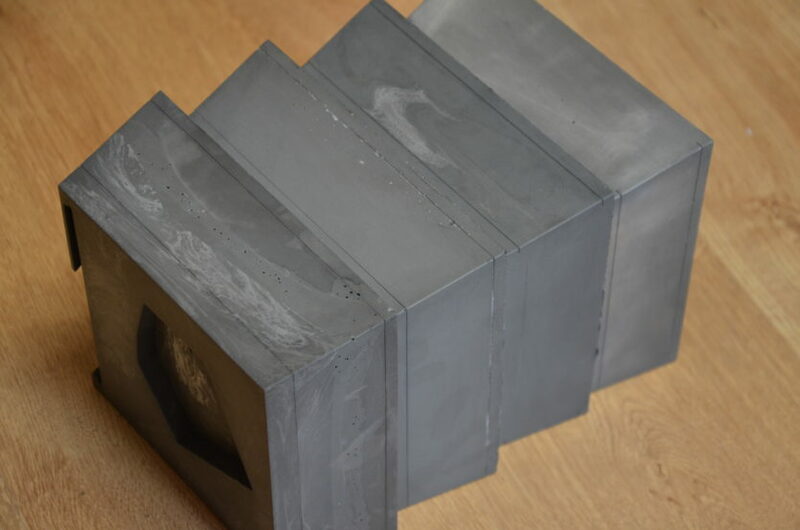 The plates undergo the same treatment, to get a better than nature metallic effect. Zooming in on the Fortnite plate after polishing. It looks almost perfectly identical to our 3D renders and matches both our expectations those of our client, which means a perfectly accomplished goal and lots of hearts filled with joy. 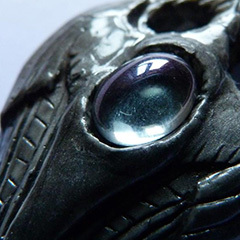 All in all, this project went on for a little more than two months, and brought us an enormous quantity of experience in casting resin objects. We are particularly proud of the result we obtained. While we have had some setbacks on the way, sometimes costly, these were setbacks that pushed us to refine our techniques and expand our crafting expertise. We invested in new machines and tools (pressure pots, polishing brushes, etc.) and thanks to them we are now equipped to tackle even bigger challenges in the future! Centres d’intérêts : Jeux vidéo comme Heroes of the Storm et Super Smash Bros, collectionneur (modéré) de consoles rétro. Spécialités : Sculpture sur bois et mousse.